A renal artery aneurysm (RAA) is defined as a dilated segment of renal artery that exceeds twice the diameter of a normal renal artery. Symptomatic RAAs can cause hypertension, pain, hematuria, and renal infarction. Asymptomatic RAAs may seem benign, but the potential for rupture and fistulization increases with size. Asymptomatic patients can be referred for elective repair, but if patients are symptomatic, further investigation with possible surgical intervention should be considered. The renal arteries arise from the aorta at the level of the intervertebral disc between L1 and L2. Cadaveric studies have shown that more than one renal artery is present in 15% and 20% of cases on the right and left sides, respectively. 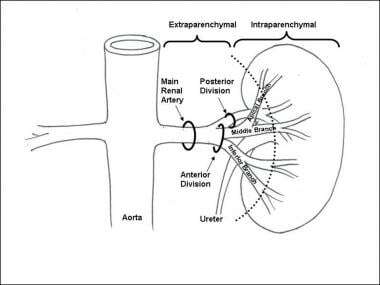 Schematic of renal artery anatomy. The aneurysm location can be classified as extraparenchymal or intraparenchymal. Of patients with RAAs, 20% present with bilateral pathology, and 30% have multiple aneurysms. RAAs occur with equal frequency in men and women, though ruptures are more common in reproductive-aged women. In true aneurysms, a weakening then dilatation of all layers of the arterial wall occurs. In fibromuscular dysplasia (FMD), the degenerative fibroplasia-type changes lead to this wall weakening. Often, renal artery stenosis is associated. [21, 17] Most patients with FMD are healthy, young, hypertensive women, and on angiography the renal artery appears as a string of beads, with the aneurysm at the renal artery bifurcation. Intraparenchymal aneurysms are believed to arise primarily from inflammatory changes of the vessel wall. These commonly develop into microaneurysms. Intrarenal aneurysms are usually found in multiples and are often associated with arteriovenous fistulas. Many causes of RAA exist, each with different morphologies and locations along the renal artery. The lesions can be grouped into three main categories as follows. Overall, the average age for patients to present with RAAs is between the ages of 40 and 60 years, with a female predominance owing to the increased prevalence among patients with FMD. Surgical repair of RAA appears to have long-term durability, though most reported series are small and from single centers. Coleman DM, Stanley JC. Renal artery aneurysms. J Vasc Surg. 2015 Sep. 62 (3):779-85. [Medline]. Down LA, Papavassiliou DV, O'Rear EA. Arterial deformation with renal artery aneurysm as a basis for secondary hypertension. Biorheology. 2013 Jan 1. 50(1):17-31. [Medline]. Baandrup U, Fjeldborg O, Olsen S. Spontaneous dissecting aneurysm of the renal arteries. A case and a review of the literature. Virchows Arch A Pathol Anat Histopathol. 1983. 402(1):73-82. [Medline]. Bulbul MA, Farrow GA. Renal artery aneurysms. Urology. 1992 Aug. 40(2):124-6. [Medline]. Cohen JR, Shamash FS. Ruptured renal artery aneurysms during pregnancy. J Vasc Surg. 1987 Jul. 6(1):51-9. [Medline]. Dean RH, Meacham PW, Weaver FA. Ex vivo renal artery reconstructions: indications and techniques. J Vasc Surg. 1986 Dec. 4(6):546-52. [Medline]. Dzsinich C, Gloviczki P, McKusick MA, et al. Surgical management of renal artery aneurysm. Cardiovasc Surg. 1993 Jun. 1(3):243-7. [Medline]. Gewertz BL, Stanley JC, Fry WJ. Renal artery dissections. Arch Surg. 1977 Apr. 112(4):409-14. [Medline]. Hidai H, Kinoshita Y, Murayama T, et al. Rupture of renal artery aneurysm. Eur Urol. 1985. 11(4):249-53. [Medline]. Hubert JP Jr, Pairolero PC, Kazmier FJ. Solitary renal artery aneurysm. Surgery. 1980 Oct. 88(4):557-65. [Medline]. Klein GE, Szolar DH, Breinl E, et al. Endovascular treatment of renal artery aneurysms with conventional non- detachable microcoils and Guglielmi detachable coils. Br J Urol. 1997 Jun. 79(6):852-60. [Medline]. Lumsden AB, Salam TA, Walton KG. Renal artery aneurysm: a report of 28 cases. Cardiovasc Surg. 1996 Apr. 4(2):185-9. [Medline]. Martin RS 3rd, Meacham PW, Ditesheim JA, et al. Renal artery aneurysm: selective treatment for hypertension and prevention of rupture. J Vasc Surg. 1989 Jan. 9(1):26-34. [Medline]. Ortenberg J, Novick AC, Straffon RA, et al. Surgical treatment of renal artery aneurysms. Br J Urol. 1983 Aug. 55(4):341-6. [Medline]. Seki T, Koyanagi T, Togashi M, et al. Experience with revascularizing renal artery aneurysms: is it feasible, safe and worth attempting?. J Urol. 1997 Aug. 158(2):357-62. [Medline]. Stanley JC, Rhodes EL, Gewertz BL, et al. Renal artery aneurysms. Significance of macroaneurysms exclusive of dissections and fibrodysplastic mural dilations. Arch Surg. 1975 Nov. 110(11):1327-33. [Medline]. Stephens FD, Smith ED, Hutson JM. Ureterovascular hydronephrosis and the aberrant renal vessels. Congenital Anomalies of the Kidney, Urinary and Genital Tracts. 2nd ed. New York: Informa Health Care; 2002. 275-80. Aytac SK, Yigit H, Sancak T, et al. Correlation between the diameter of the main renal artery and the presence of an accessory renal artery: sonographic and angiographic evaluation. J Ultrasound Med. 2003 May. 22(5):433-9; quiz 440-2. [Medline]. Bastounis E, Pikoulis E, Georgopoulos S, et al. Surgery for renal artery aneurysms: a combined series of two large centers. Eur Urol. 1998. 33(1):22-7. [Medline]. Poutasse EF. Renal artery aneurysms. J Urol. 1975 Apr. 113(4):443-9. [Medline]. Mattar SG, Kumar AG, Lumsden AB. Vascular complications in Ehlers-Danlos syndrome. Am Surg. 1994 Nov. 60(11):827-31. [Medline]. Calligaro KD, Dougherty MJ. Renovascular disease: aneurysms and arteriovenous fistulae. Cronenwett JL, Johnston KW, eds. Rutherford's Vascular Surgery. 8th ed. Philadelphia: Elsevier Saunders; 2014. Vol 2: 2326-34. Callicutt CS, Rush B, Eubanks T, et al. Idiopathic renal artery and infrarenal aortic aneurysms in a 6-year-old child: case report and literature review. J Vasc Surg. 2005 May. 41(5):893-6. [Medline]. Pliskin MJ, Dresner ML, Hassell LH, Gusz JR, Balkin PW, Lerud KS, et al. A giant renal artery aneurysm diagnosed post partum. J Urol. 1990 Dec. 144(6):1459-61. [Medline]. Witz M, Lehmann JM. Aneurysmal arterial disease in a patient with Ehlers-Danlos syndrome. Case report and literature review. J Cardiovasc Surg (Torino). 1997 Apr. 38(2):161-3. [Medline]. Ohebshalom MM, Tash JA, Coll D, et al. Massive hematuria due to right renal artery mycotic pseudoaneurysm in a patient with subacute bacterial endocarditis. Urology. 2001 Oct. 58(4):607. [Medline]. Yacoe ME, Dake MD. Development and resolution of systemic and coronary artery aneurysms in Kawasaki disease. AJR Am J Roentgenol. 1992 Oct. 159(4):708-10. [Medline]. Smith JN, Hinman F Jr. Intrarenal arterial aneurysms. J Urol. 1967 Jun. 97(6):990-6. [Medline]. Seppala FE, Levey J. Renal artery aneurysm: case report of a ruptured calcified renal artery aneurysm. Am Surg. 1982 Jan. 48(1):42-4. [Medline]. Tham G, Ekelund L, Herrlin K, et al. Renal artery aneurysms. Natural history and prognosis. Ann Surg. 1983 Mar. 197(3):348-52. [Medline]. Zhang LJ, Yang GF, Qi J, Shen W. Renal artery aneurysm: diagnosis and surveillance with multidetector-row computed tomography. Acta Radiol. 2007 Apr. 48(3):274-9. [Medline]. Sicard GA, Reilly JM, Rubin BG, et al. Transabdominal versus retroperitoneal incision for abdominal aortic surgery: report of a prospective randomized trial. J Vasc Surg. 1995 Feb. 21(2):174-81; discussion 181-3. [Medline]. Buck DB, Curran T, McCallum JC, Darling J, Mamtani R, van Herwaarden JA, et al. Management and outcomes of isolated renal artery aneurysms in the endovascular era. J Vasc Surg. 2016 Jan. 63 (1):77-81. [Medline]. Henriksson C, Bjorkerud S, Nilson AE, et al. Natural history of renal artery aneurysm elucidated by repeated angiography and pathoanatomical studies. Eur Urol. 1985. 11(4):244-8. [Medline]. Morita K, Seki T, Iwami D, Sasaki H, Fukuzawa N, Nonomura K. Long-term outcome of single institutional experience with conservative and surgical management for renal artery aneurysm. Transplant Proc. 2012 Jul-Aug. 44(6):1795-9. [Medline]. Youkey JR, Collins GJ Jr, Orecchia PM, et al. Saccular renal artery aneurysm as a cause of hypertension. Surgery. 1985 Apr. 97(4):498-501. [Medline]. Low G, Winters SD, Owen RJ. Surveillance of a coiled renal artery aneurysm by contrast-enhanced ultrasound with Definity. J Vasc Surg. 2011 Dec. 54 (6):1801-4. [Medline]. Seo JM, Park KB, Kim KH, Jeon P, Shin SW, Park HS, et al. Clinical and multidetector CT follow-up results of renal artery aneurysms treated by detachable coil embolization using 3D rotational angiography. Acta Radiol. 2011 Oct 1. 52(8):854-9. [Medline]. Klausner JQ, Lawrence PF, Harlander-Locke MP, Coleman DM, Stanley JC, Fujimura N, et al. The contemporary management of renal artery aneurysms. J Vasc Surg. 2015 Apr. 61 (4):978-84. [Medline]. Gandini R, Morosetti D, Chiocchi M, Chiaravalloti A, Citraro D, Loreni G, et al. Long-term follow-up of endovascular treatment of renal artery aneurysms with covered stent deployment. J Cardiovasc Surg (Torino). 2016 Oct. 57 (5):625-33. [Medline]. Cappucci M, Zarco F, Orgera G, López-Rueda A, Moreno J, Laurino F, et al. Endovascular treatment of visceral artery aneurysms and pseudoaneurysms with stent-graft: Analysis of immediate and long-term results. Cir Esp. 2017 May. 95 (5):283-292. [Medline]. Samarasekera D, Autorino R, Khalifeh A, Kaouk JH. Robot-assisted laparoscopic renal artery aneurysm repair with selective arterial clamping. Int J Urol. 2014 Jan. 21 (1):114-6. [Medline]. Wei HB, Qi XL, Liu F, Jie W, Ni XF, Zhang Q, et al. Robot-assisted laparoscopic reconstructed management of multiple aneurysms in renal artery primary bifurcations: a case report and literature review. BMC Urol. 2017 Oct 16. 17 (1):96. [Medline]. Love WK, Robinette MA, Vernon CP. Renal artery aneurysm rupture in pregnancy. J Urol. 1981 Dec. 126(6):809-11. [Medline]. Adeyemi J, Johnson J, Rits Y, Akingba AG, Rubin J. Ex-vivo Reconstruction and Autotransplantation for Hilar Renal Artery Aneurysms in Patients with Congenital Anomalies. Ann Vasc Surg. 2017 Sep 8. [Medline]. Duprey A, Chavent B, Meyer-Bisch V, Varin T, Albertini JN, Favre JP, et al. Editor's Choice - Ex vivo Renal Artery Repair with Kidney Autotransplantation for Renal Artery Branch Aneurysms: Long-term Results of Sixty-seven Procedures. Eur J Vasc Endovasc Surg. 2016 Jun. 51 (6):872-9. [Medline]. Zhang Z, Yang M, Song L, Tong X, Zou Y. Endovascular treatment of renal artery aneurysms and renal arteriovenous fistulas. J Vasc Surg. 2013 Mar. 57(3):765-70. [Medline]. Juszkat R, Zarzecka A, Stanisic M, Majewski W. [Endovascular treatment of the renal artery aneurysm with stent and coils]. Przegl Lek. 2012. 69(7):353-6. [Medline]. Dorigo W, Pulli R, Azas L, Fargion A, Angiletta D, Pratesi G, et al. Early and Intermediate Results of Elective Endovascular Treatment of True Visceral Artery Aneurysms. Ann Vasc Surg. 2016 Jan. 30:211-8. [Medline]. Ruhnke H, Kröncke TJ. Visceral Artery Aneurysms and Pseudoaneurysms: Retrospective Analysis of Interventional Endovascular Therapy of 43 Aneurysms. Rofo. 2017 Jul. 189 (7):632-639. [Medline]. Clark TW, Sankin A, Becske T, et al. Stent-assisted Gugliemi detachable coil repair of wide-necked renal artery aneurysm using 3-D angiography. Vasc Endovascular Surg. 2007 Dec-2008 Jan. 41(6):528-32. [Medline]. Bracale UM, Narese D, Ficarelli I, Laurentis M, Spalla F, Dinoto E, et al. Stent-assisted detachable coil embolization of wide-necked renal artery aneurysms. Diagn Interv Radiol. 2017 Jan-Feb. 23 (1):77-80. [Medline]. [Full Text]. Dulabon LM, Singh A, Vogel F, et al. Intrarenal pseudoaneurysm presenting with microscopic hematuria and right flank pain. Can J Urol. 2007 Jun. 14(3):3588-91. [Medline]. Rautio R, Haapanen A. Transcatheter embolization of a renal artery aneurysm using ethylene vinyl alcohol copolymer. Cardiovasc Intervent Radiol. 2007 Mar-Apr. 30(2):300-3. [Medline]. Moyer HR, Hiramoto JS, Wilson MW, et al. Stent-graft repair of a splenic artery aneurysm. J Vasc Surg. 2005 May. 41(5):897. [Medline]. Bui BT, Oliva VL, Leclerc G, et al. Renal artery aneurysm: treatment with percutaneous placement of a stent-graft. Radiology. 1995 Apr. 195(1):181-2. [Medline]. Berger L, Palcau L, Gouicem D, Coffin O. Persistent type B aortic dissection treatment by renal artery reentry stent grafting as an alternative to open surgery. Ann Vasc Surg. 2013 May. 27(4):498.e5-8. [Medline]. Iezzi R, Santoro M, Di Natale G, Pirro F, Dattesi R, Nestola M, et al. Aortic-neck dilation after endovascular abdominal aortic aneurysm repair (EVAR): can it be predicted?. Radiol Med. 2012 Aug. 117 (5):804-14. [Medline]. (A) Aortogram with calcified left renal artery aneurysm (RAA). (B-C) Same RAA in magnified view, demonstrating the RAA is saccular, arising from the main renal artery. (A) Computed tomography scan and (B) arteriogram of the same patient with a saccular left renal artery aneurysm at a segmental renal artery branch. Magnetic resonance imaging of a patient with 2 left renal artery aneurysms. Both are saccular, one is at a segmental branch (closed arrow) and the other is intrarenal (open arrow). Of note: this patient also has a congenital absence of the right kidney. (A) Extraparenchymal saccular aneurysm. (B) Tangential excision with patch angioplasty. (A) Fibromuscular dysplasia with string-of-beads appearance and wide-necked extraparenchymal saccular aneurysm. (B) Aneurysm excision with reconstruction using a bypass graft. Arteriogram of saccular renal artery aneurysm after coil embolization. Subsequent expansion of aneurysm 6 months after coil embolization. (A) Renal artery stenosis with poststenotic fusiform aneurysm. (B) Exclusion of aneurysm and dilatation of stenosis with endovascular stent graft.